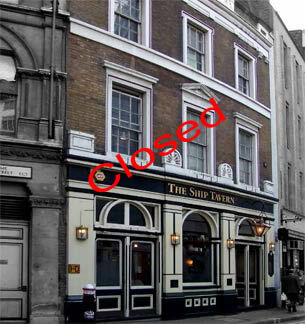 The Ship Tavern is just across the road from Leadenhall Market and trys hard to get a share of the passing trade. The pub is situated in a three-storey building, the front is beautifully presented and hints at the style of the pub to come. There is a plaque on the wall at the front which reads "Originally called The Ship & Shovel, the eighteenth century Inn developed an intimate connection with tea, coal and the established church. The church connection was with St. Paul's Cathedral; the building of which was paid for in coal, or rather by a tax on that commodity. All the coal entering that part of London was weighed and taxed by shovel load; and one of the places it was weighed and taxed was outside The Ship Inn Lime Street. Coal heavers weighed it out using large style shovels; being dusty and thirsty work they often refreshed themselves at The Ship, leaving their shovels propped against the outside wall, hence The Ship & Shovel". What you find downstairs is a lovely traditional style pub, wooden floors and London Pride on at the pumps. The seafaring theme is reflected in the stuffed fish and lanterns dotted around. The staff are both plentiful and helpfully, food does appear somewhat expensive with 'seasoned wedge fries' costing £4.95, although we did not eat, but the beer was good. A lovely and totally quirky fact about The Ship Tavern is that dispite being a below ground level pub, your find the toilets downstairs!